Earlier this year, we heard from Dr. Lucinda Sykes of Meditation for Health about a scuba diver cutting a manta ray loose from fishing lines that had somehow ensnared it. This amazing story had reminded me of Dr. Ihaleakala Hew Len's comments about a "Gordian knot" of memories and data that entangles us -- and how Ho'oponopono cleaning can help us free ourselves. 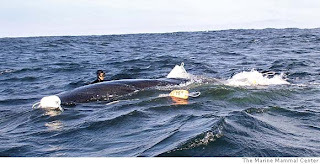 Today another colleague, Dr. Cheryl Feng from the California Center for Homeopathic Education, sent me a similar story -- this one about divers rescuing a humpback whale off the Farrallon Islands (near San Francisco) . The 45-to 50-foot whale was on her usual migratory route between the Northern California coast and Baja California when she got entangled in some nylon ropes that link crab pots. A crab fisherman spotted her, and called for help. Soon an entire team of divers from the Marine Mammal Center arrived to survey the situation . . . realizing that their only chance of freeing her was to dive into the water themselves. Yes, dive into the water with a 50-ton whale -- who could kill a man with one flip of her tail. But about 20 crab-pot ropes (240 feet long with weights every 60 feet) were wrapped around the creature. Rope circled at least 4 times around her tail, her back, and her left front flipper . . . and there was a line in her mouth. She couldn't eat, and would almost certainly die without help. So into the water slipped 4 very brave divers, who spent an hour cutting the ropes with a special curved knife. The whale rested passively the entire time. They noticed she was giving off a strange kind of vibration in the water, that they could feel as they worked. Humpbacks are known for complex vocalizations that sound like singing. Maybe she was offering the divers an "ultrasound" treatment of sorts, or perhaps the whale equivalent of purring? Who knows. People on whale-watching cruises also know humpback whales for their acrobatic breaching -- playful activity where they lift their bodies out of the water and splash down. Thankfully, she didn't do that while these divers were swimming with her. "When I was cutting the line going through the mouth, its eye was there winking at me, watching me," described one of the divers. "It was an epic moment of my life." "It seemed kind of affectionate, like a dog that's happy to see you. I never felt threatened. It was an amazing, unbelieveable experience." Although no one really knows what was on her mind, this whale was doing little dives and the divers were rubbing shoulders with her. Was she saying thank you somehow? What must it have felt like to swim away from all those crab pots, free and unfettered? And what made her trust that these people would not hurt her? Although most humpback whales don't like to interact so much with humans, this one allowed them to work with her very closely. Might Ho'oponopono make such freedom and trust possible for us? Might we humans -- who like to manage problems on our own! -- learn to allow Divinity to untangle our own Gordian knots? Could we learn to trust that It knows what It's doing with us, after all? The possibility seems more than worth the practice. Many thanks to Dr. Sykes, Dr. Feng, the manta ray, and the humpback whale for reminding me.